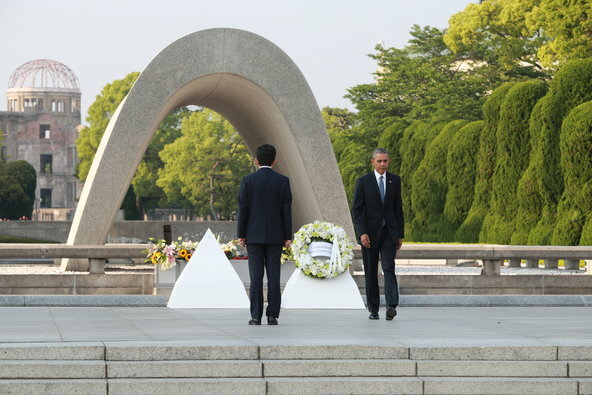 Obama with Shinzo Abe at the memorial site. US President Obama, visited the Japanese city of Hiroshima on Friday morning, seven decades after the city was nuclear-bombed in 1945 ending WW-II. The visit opens up an opportunity for reconciliation between the former enemies and reaffirms their alliance on eradicating global nuclear weapons. After the G7 summit, the President flew to Marine Corps Air Station Iwakuni where he addressed service members and others. Obama hailed the US-Japan alliance as “one of the strongest in the world”, with his visit showing how “two nations, former adversaries, cannot just become partners, but become the best of friends”. He participated in a wreath-laying ceremony with Prime Minister Shinzo Abe at the Hiroshima Peace Memorial, accompanied by war survivors, where an eternal flame remembers Hiroshima’s dead. The visit is “a testament to how even the most painful of divides can be bridged”, he said. However, Obama expressed an unwillingness to revisit former US President Harry S. Truman’s decision to drop an atom bomb in Japan seven decades ago. He further added that he will not be apologising for the attack. On 6th August 1945, at least 140,000 people were killed in Hiroshima as a result of the world’s first nuclear bombing. And only two days later 74,000 lives were killed in Nagasaki, by a second bombing. The majority of Americans, and some historians are of the opinion that the bombing ended the war and saved lives and atrocities, although some historians question that view. Most Japanese believe they were unjustified. “It is worth focusing on Hiroshima, but it’s even more important that we should not forget Nanjing,” Chinese Foreign Minister Wang Yi told reporters, according to the ministry’s website, “The victims deserve sympathy, but the perpetrators can never escape their responsibility,” expressed Wang. China claims that Japanese troops killed 300,000 people in 1937, at the former capital of Nanjing. A postwar Allied tribunal put the death toll at 142,000 which is denied by Japanese politicians and scholars. “Part of the reason I’m going is because I want to once again underscore the very real risks that are out there and the sense of urgency that we all should have,” Obama said on Thursday night. Critics have blamed both sides of policies backed by nuclear deterrence while claiming to work on ending the nuclear-race. “The U.S. has misled the public opinion by creating the impression that the ‘nuclear threat’ from North Korea is the biggest problem facing the international community,” expressed North Korea through its official news agency, regarding the US visit.